Situated off the west coast of Scotland, the Isle of Skye is known for its beautiful scenery and unique land formations. The spectacular ridge of hills (the result of a massive landslip) that runs for about 30km, form the backbone of the Trotternish peninsula in the north east of Skye contains one of the islands most recognisable landmarks, the Old Man of Storr (in Gaelic ‘Bodach an Stòrr’). Taking its name from the escarpment on which it stands, the Old Man of Storr is the most famous of the rocky basalt pinnacles which dot the landscape. Standing at an elevation of 2,359 feet and at a height of about 160 feet, its prominent position and strange shape have over the centuries given rise to a number of stories which even today imbue the landscape with a sense of mystery and romance. Legend has it that in the early years of Christianity in Scotland, a dispute raged over the exact date of Easter. In order to put an end to the quarrel, a priest from Skye decided to travel to Rome and speak to the Pope himself. Climbing the Storr early one dawn just as the sun began to rise, he performed a spell which raised the devil and transformed him into a horse. During the journey, the devil questioned the priest about the reason for the journey. The priest had to use all his wits to answer the questions truthfully but at the same time avoid mentioning the name of “God”, which if uttered would break the spell resulting in the devil disappearing and the priest falling into the sea. The priest was successful and despite the devil’s trickery, arrived in Rome, learnt the date of Easter and returned safely to Skye. The devil was so impressed with the cleverness of his adversary that on leaving he was heard to utter the ominous words: “until we meet again”. Giants occur frequently in traditional Scottish folklore. In particular they are associated with the landscape and peoples of Western Scotland. The formation of many natural features was often ascribed to the exploits of these giants who frequently came into conflict with men, always coming off worse. One of the enduring stories relating to the Old Man of Storr is that it was the thumb of a giant who when he died became buried in the earth. Another version is that whilst fleeing from attackers, two giants, an old man and his wife made the unfortunate decision to look back and as they did so were turned to stone. During the day brownies are believed to hide in the house and at night do jobs for the family they have chosen to serve. The slightest attempt to reward them for their service, will result in the brownie disappearing for ever. The story goes that a villager by the name of O’Sheen saved the life of a brownie and never asked for anything in return. Over time the two became good friends. One day whilst the brownie was away, O’Sheen died of a broken heart following the death of his wife. 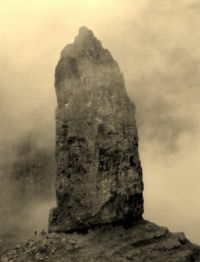 When the brownie returned and heard of his friend’s death, he was so upset, that he chiselled two rocks, a larger one in honour of his friend, which became known as the Old Man of Storr and a smaller one for O’Sheen’s wife. The fay or fairies are often found in Scottish folklore and can include any type of magical creature such as gnomes, brownies, redcaps, the bean sidhe better known as banshees in Irish mythology and glaistigs, beautiful women with the upper body of a woman and the lower body of a goat found near ancient stones. Unlike in Victorian stories where fairies are depicted as small, cute and harmless, people in the past had a very different view of them. The belief that fairies were part of an unknown, dark and invisible world, a threatening malevolent presence to be feared can be seen in their portrayal in folktales where they are often shown as devious, tricking humans and even stealing their souls. A man who walked up the hill every evening with his small wife found one day that they had grown too old and his wife could no longer climb to the top to join him. The fairy folk who had watched them go up every evening, offered the old man the chance to always have his wife with him wherever he went. The old man accepted the offer but the fairy folk tricked them and turned them both into pillars of rock, ensuring that they would indeed always be together. Even today when people no longer believe in fairies, giants and brownies these tales still have the power to enchant and fascinate. Appearing in films such as Prometheus and Snow White and the Huntsman, the power and mystery of the stones continue to play their part in shaping imaginations as well as their own legend. Hi Lenora, thank you so much for dropping by my blog. I’ve really enjoyed reading ‘The Haunted Palace’ and share your love of the supernatural and unexplained. Will be back again soon. Hi Rachael, thank you for visiting and for your kind words. I love history and was really pleased to come across your blog its wonderful! A lovely mysterious post about the Old Man. Thank you for your comment. Your photos are amazing, you seemed to have had a better weather day than we did! Scotland is beautiful and I love how its myths and legends create such a mysterious and haunting landscape. I have lived on Skye my entire life and have never heard any of these stories. Thanks so much, its always good to find out more about the place you live. Thank you for your comment. You are so lucky to live in Skye. It is truly one of the most beautiful places I have ever visited and the history and folklore which are so much a part of the landscape just make it even more magical. These are fascinating – why was I not already following you?! Thank you, I am so glad you enjoyed the post. Miss Jessel and I love delving into the weird and unusual aspects of history and folklore, I hope you enjoy reading more of our posts! all the best, Lenora. We visited in January 2017. I had forgotten the stories about the Old Man and the Old Woman told by our driver and guide. I was writing up legends for my photographs today and found your page and thanks for jogging my memories! A beautiful part of the world – even during the dead of winter as it was on our visit! Thank you for your kind comment, glad I could be of some help. I agree Skye is beautiful at any time of the year and somehow the mist and cold just makes the Old Man of Storr more mysterious.